Cruising around the streets of Miami is all about doing it in luxury style. You’ll want to be as comfortable inside of your car and as good-looking as the car is on the exterior. While many people merely see transportation as a way to get from Point A to Point B, we think that the driving experience is much more than that here at Miami Art Cars. We want you to fully enjoy your experience from the moment you get in the car to the moment you get out, and that’s why we offer our exotic car rental service in the greater Miami area! 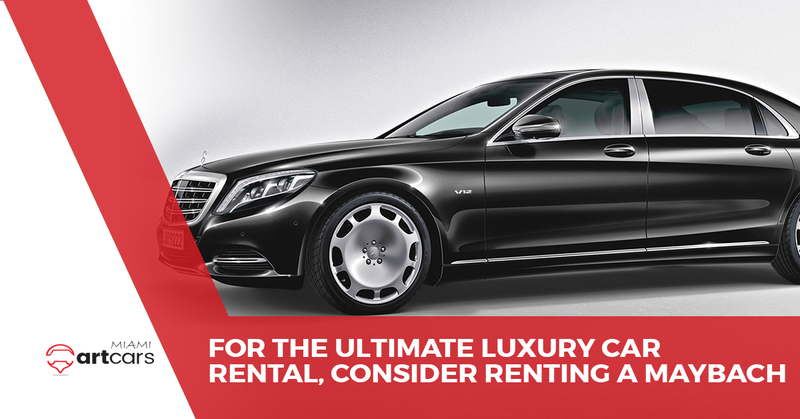 In today’s blog post, we’re going to talk about the beautiful Mercedes Benz Maybach and why renting this particular vehicle puts you in a high-end car rental like none other. To rent your very own, visit our rental information page or read on to learn more about the beauty of this truly amazing vehicle. While Mercedes Benz is already hailed as a high-quality, well-built luxury German car company, their Maybach brand takes things to another level of luxury and class. Our signature model that we’re renting is a variation of the classic Mercedes Benz S Class, their flagship sedan that’s heralded for the latest advancements in automotive safety technology and automotive luxury. As a longer wheelbase version of the standard S Class, the Maybach is essentially the first class experience of driving around. In other words, you really won’t find a more comfortable ride than this. Despite the fact that Miami is absolutely flooded with expensive sports cars and luxury cars on the road, what you’ll notice when you drive around is that there aren’t many Maybachs to be seen. After all, cars like the Porsche 911 and even something as nice as the Ferrari 458 Italia are merely commoner’s vehicles in a place as nice as the Miami area. Of course, if there are Maybachs around, Miami would be the place to see them…so why not make that next rare Maybach sighting your own? Backed by the history of Mercedes Benz quality, when you rent a Maybach with Miami Art Cars, you should know that you’re renting a luxury sedan that’s as well-built as it is good looking. If you’re looking to show off your status or impress a major client when you’re out here visiting in Miami, then the Maybach is one of our all-time best rentals for you to look into. Not only will the striking visual appeal dazzle and wow your business associates, but the fact that you’re coming out of a Maybach says more than enough about your quality character and where your values lie. There’s a good reason that one’s personality tends to match the kind of car that they drive, and a Maybach rental is a very classy and profound statement to make in regard to your personality. So Come Rent A Mercedes Benz Maybach Today! For the ultimate statement in class and style, an exotic car rental from Miami Art Cars is exactly what you need. Schedule your very own Maybach rental with us today by visiting here! Rent Your Own Maybach Today!